I asked my friends for any piece of advice or wisdom or a joke they would wish to pass on to their loved ones – here’s what they said. “Don’t worry” i.e. don’t dwell on potential future upsets. “If you look at the target as an enemy, you will never make progress. The target is your point of reference, not your opponent.” i.e. admire, take on board and make part of you the good in your competitors and opponents. In the context of trying to game the stock market: “Most good buy signals mean just that – good bye (to your money)”. Everyone’s a pilot or a passenger – which are you? Probably best to find out before the plane takes off. Never judge anyone unless you are prepared to be judged. Unless you’re a judge. Don’t be a glass-is-half-empty kind of person. If you can’t finish a drink, don’t start it. If at first you don’t succeed, cheat! Whatever a man’s age may be he can reduce it by several years by putting a bright coloured flower in his buttonhole. Once upon a time, there was a non-conforming sparrow..
Today imagine you’re a star shining brightly in the infinite universe. It’ll give you something to do while you walk round the garden centre. If you’ve watched any of his videos you may be intrigued to know what Zeos from the YouTube channel Z Reviews looks like. I found this frame in one of his videos (Best of Zeos Pantera) showing what looks to be a reflection of his face. If you find anything clearer or know any more details about this funny chap (does he have a regular job?) please share in a comment below! If you’re wondering how these compare read on. Right now the 840 is available for £110 and the 440 for £60 in the UK. Is the former worth almost twice the price of the latter? The 440 is brighter sounding than the 840 so picks out and abnormally highlights guitar strings and cymbals. As a consequence of this vocals can sound slightly less present and realistic/natural than they should. The 440 also has less extended bass so bass drum and double bass sound less natural however what bass it does have is more punchy i.e. has a faster attack and decay making it toe-tapping. It has a creaky plastic physical design against the 840’s more solid but also heavier (372g v 311g) design. The difference in sound is not night and day and on first comparing them the 440 comes across as more lively and appealing because of its brighter frequency response. Overall however, over more extended listening, the 840 is the more emotionally involving and better headphone with more natural vocals (almost Sennheiser HD600 quality) and a more even frequency response. That said, the 840 is noticeably heavier and more uncomfortable on the top of one’s head. The 840 is like a more sensitive (requires a lower volume level setting to achieve the same loudness) but less comfortable HD600 with punchier and deeper bass but slightly less realistic vocals. Overall across genres the 840 sounds better than the HD600 but is much less comfortable (in fact it’s painful). 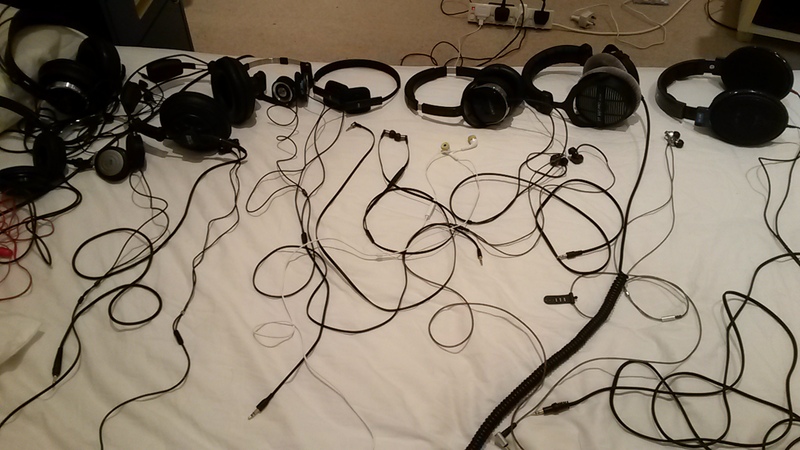 These observations were made with the headphones ‘burnt in’ having had over 50 hours playing time. clear transparent natural sounding midrange vocals that are not recessed (Beyerdynamic DT990 Pro problem) or abnormally coloured in timbre (a problem with the metallic-sounding Fiio EX1 / Dunu Titan 1 when fitted with incorrect tips). All this in a comfortable design (Shure SRH840 and Jays v-JAYS problem) that is loud enough straight out of a phone (HD600 problem) and one can go to sleep wearing (SRH840 and HD600 problem). In a nutshell I look for sufficient tight punchy bass, uncoloured natural-sounding vocals, and sufficient unsibilant highs i.e. an extended flat frequency response with impact and low level detail without colouration or resonance. In summary, I find both to be some of the most accurate and enjoyable headphones I’ve listened to. Ignoring the comfort issue the SRH840 is overall better sounding than the 440 across musical genres (especially for genres with deep bass such as electronic) however the 440 is say 90% there for almost half the price. Indeed for some tracks where the strings are subdued in the mix (perhaps the mixing itself was done on upper mid-forward monitors / headphones like the 440 itself) or where you simply prefer to hear more of those string sounds the 440 sounds better. Also at a very low listening volume vocals on the 440 can sound clearer since there is less bass. The 840 is highly rated by Z Reviews and Head-Fi also has mainly very favourable reviews. Taking comfort into the equation if I had to choose between these two headphones the 440 wins because I couldn’t wear the 840 for more than half an hour. Additionally, since the cups on the 440 are a little slimmer it’s possible to wear them while going to sleep. £120 (used) Sennheiser HD600 headphones or £50 Fiio EX1 earphones when I’m after a very revealing ‘audiophile’ experience. How do you save documents in Word Online? If you’re using the completely browser-based version of Microsoft Word and are used to pressing Ctrl-S frequently in the Desktop version to save your work as you go you may be wondering how to achieve the same. Differences between using a document in the browser and in Word says: “You save a document manually in Word Online; there is no auto-save feature.” so I guess the answer is you don’t save documents and just hope that they are automatically being saved! How to collaborate on documents for free without your collaborators needing anything other than internet access? Google documents – create yourself a free Google account (if you don’t already have one) and use Google Drive to create a document (such as a spreadsheet). From the file’s share settings click ‘Get shareable link’ and then select ‘Anyone with the link can edit’. Email the link address of your document to just those people you want to collaborate with and ask them not to forward the link to anybody else. Here’s an example. Microsoft OneDrive documents – create yourself a free Microsoft account (if you don’t already have one) and use OneDrive to create a document (such as a spreadsheet). From the file’s share settings click ‘Get a link’ and then select ‘Edit’. Email the link address of your document to just those people you want to collaborate with and ask them not to forward the link to anybody else. Here’s an example. Curiously the Microsoft way seems a bit more tolerant of collaborators using old browser versions however when they click on the link to open your document it’s not obvious that they can edit it as well as view it (they need to click the green ‘Edit in Browser’ button near the top right). With the Google way only relatively recent browser versions are supported however when they click on the link to open your document they can start editing it straight away.